A1 Asphalt Paving & Sealing, LLC provides crack filling, sealing and striping all in one service using a commercial hot pour crack filler. 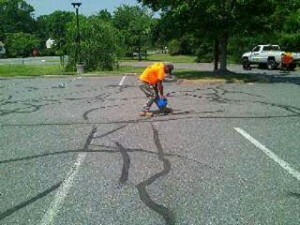 We also have the crews in-house to seal and stripe your parking lot in one turn-key service. Please contact A1 Asphalt for a Proposal on the full spectrum of our parking lot maintenance services.